Cook bacon in a Dutch oven over medium heat 10 minutes or until crisp. Remove bacon, and drain on paper towels, reserving drippings in Dutch oven. Crumble bacon. Add broth, brown sugar, and salt to drippings in Dutch oven, and bring to a boil. 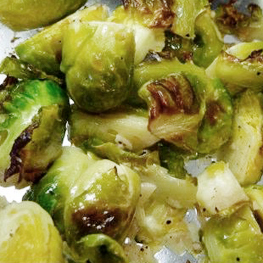 Stir in Brussels sprouts. Cover and cook 6 to 8 minutes, or until tender. Transfer Brussels sprouts to a serving bowl using a slotted spoon, and sprinkle with bacon. Serve immediately. This entry was posted in Healthy Ideas, Holiday, Metabolic Medical Center Recipes, Modified Profast (Fast and Flexible) Recipes, Vegetables and tagged brussel sprouts, chicken broth, low salt, side dish, thanksgiving, turkey bacon, Vegetable by foodies4mmc. Bookmark the permalink.